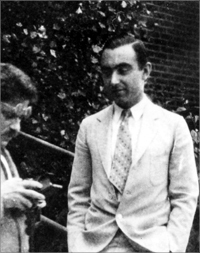 Otto Laporte was Professor of Physics at the University of Michigan (1924-1971). Other institutional affiliations included the National Bureau of Standards. His research interests included spectroscopy and fluid dynamics. July 23, 1902Birth, Mainz (Germany : Landkreis). 1920 – 1921Attended University of Frankfurt, Frankfurt am Main (Germany). 1924Obtained PhD in Physics, University of Munich, Munich (Germany). 1924 – 1926International Education Board Fellow, National Bureau of Standards. 1924 – 1971Instructor in Physics (1924-1926); Assistant Professor of Physics (1927-1935); Associate Professor of Physics (1935-1945); and Professor of Physics (1945-1971), University of Michigan, Ann Arbor (Mich.). 1928Instructor, Institute of Physical and Chemical Research, Tokyo (Rikagaku Kenkyūjo (Japan)). 1928Instructor, Kyoto Imperial University (Kyoto Daigaku). 1933Instructor, Tokyo Imperial University (Tōkyō Teikoku Daigaku). 1937Instructor, Tokyo Imperial University (Tōkyō Teikoku Daigaku). 1949 – 1950Intelligence Analyst, European Command Headquarters, United States Army. 1954 – 1956Scientific Attaché, United States Embassy, Tokyo, United States Department of State. 1961 – 1963Scientific Attaché, United States Embassy, Tokyo, United States Department of State. 1971Member, National Academy of Sciences. March 28, 1971Death, Ann Arbor (Mich.). First wife. Married 1933. Died 1957. Advised by Laporte at University of Michigan, "The application of the X-ray laws to optical spectra of higher rank, and the classification of Ga IV and Ge V."
PhD advisor at University of Munich, "Die Struktur des Eisenspektrums." Intelligence Analyst, European Command Headquarters. Scientific Attaché, United States Embassy, Tokyo. Instructor in Physics; Assistant Professor of Physics; Associate Professor of Physics; and Professor of Physics. Obtained PhD in Physics (1924). David M. Gates student notebooks, 1940-1946. Eulogies for Harrison McAllister Randall, 1969. Gail P. Smith autobiography, circa 1965. Harry E. Moses student notebooks, 1943-1947. Oral history interview with Harrison M. Randall, 1964 February 19, 20 and 1965 June 21. Oral history interview with Ralph R. Goodman, 2007 September 19. Richard G. Fowler papers, 1946-1969. "Otto Laporte: 1902-1971", Biographical Memoirs of the National Academy of Sciences. Otto Laporte Physics Today obituary.